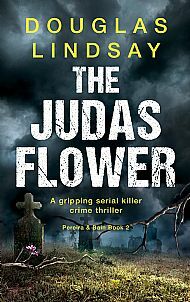 There were celebrations around the world this morning with the release of Douglas Lindsay’s new novel, THE JUDAS FLOWER. With 2017 due to go down in the history books as ‘like 1938 but stupider’, people everywhere have been searching for something to cheer about. Now, at last, as moronic super-rich dictators bring the world to the precipice of apocalypse, crowds have taken to the streets to celebrate the arrival of Pereira & Bain, Book 2. Economists provisionally estimate that sales of Pereira & Bain books will add £3.7trillion to the economy in the next six months alone, around one twenty-seventh of the money the UK is due to lose because of Brexit. Dr Shackleton was in reflective mood, as he spoke from his office on the 93rd floor of the Burj Moronica in Glasgow’s exclusive Latin quarter. "Once in a lifetime a great series of novels emerges, one that changes our perception of what literature means and, perhaps, even our perception of humanity," he said, as he gazed over the snowy peaks of the mountains north of the city. "And while we wait for that to come along, people might as well read Pereira & Bain." The Judas Flower. Click on the image to share in the magic. Comment from Marilyn at 03:31 on 13 December 2017. Have read Douglas Lindsay's work since I first discovered him via emails -- and e-books -- from Allan Guthrie. I like his writing exceedingly...(how's that for P&P speak?) and have said so in a few Amazon reviews. He knows his way around words, sentences, paragraphs, chapters, plot, character, and dialogue, so I expect The Judas Flower to not disappoint.